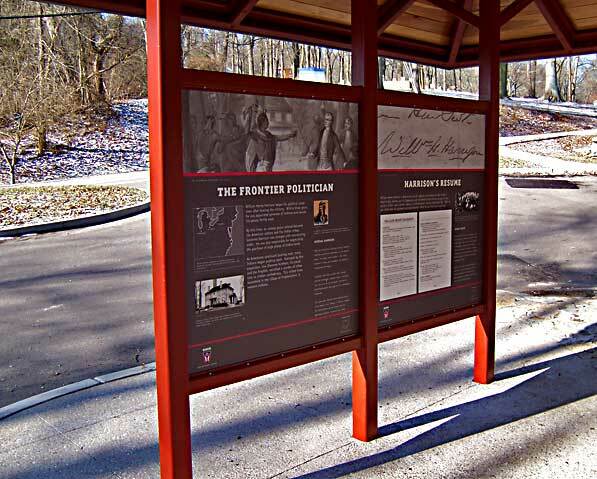 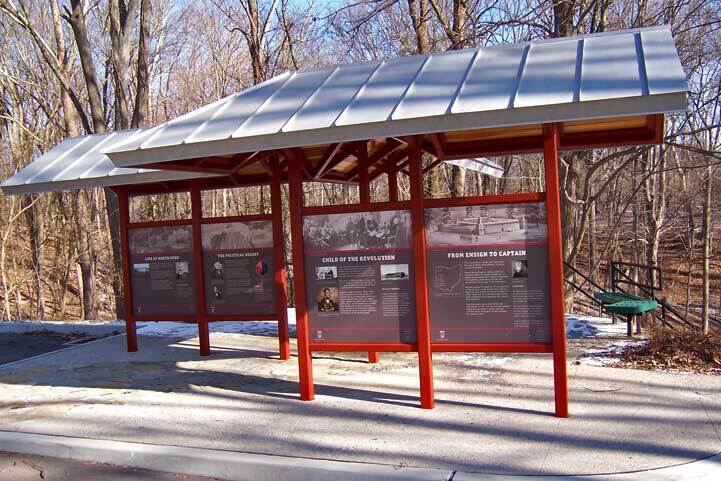 The final phase of improvements at Harrison's Tomb has been completed with the installation of interpretive displays on the kiosks at the new parking lot . 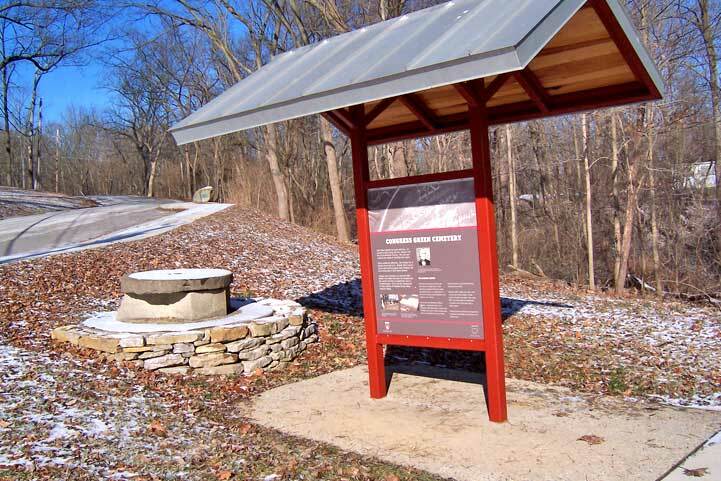 Installation took place the week of January 29th, 2007. 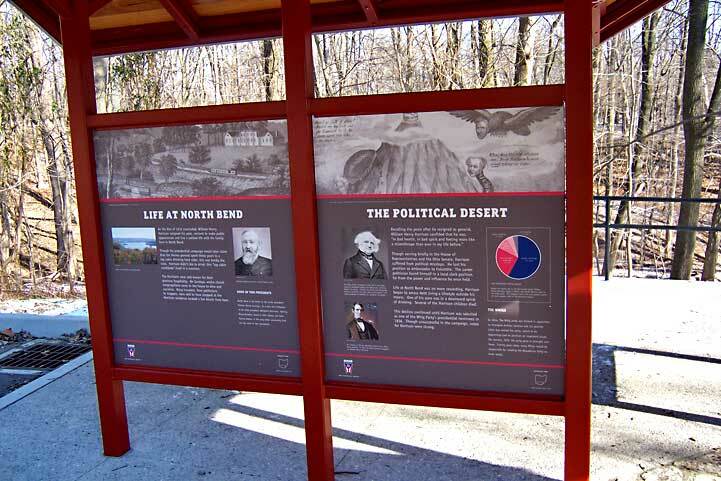 The displays are a tremendous addition to the memorial site and enhance and support the historical significance of President Harrison and North Bend in our nation's history. 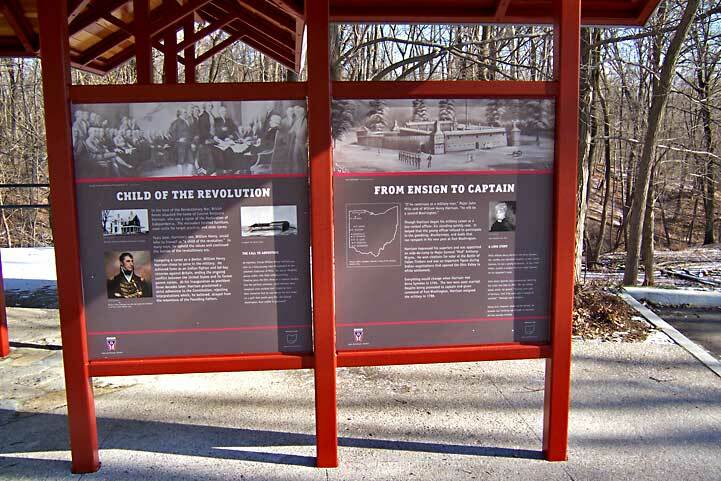 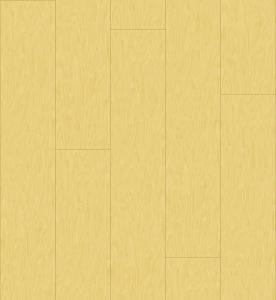 Scroll down to see pictures of the displays. 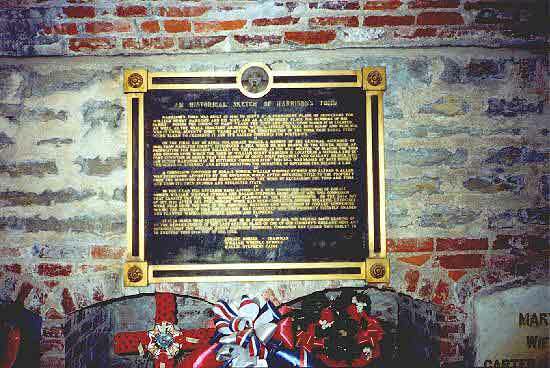 The final resting place of the ninth U.S. President. 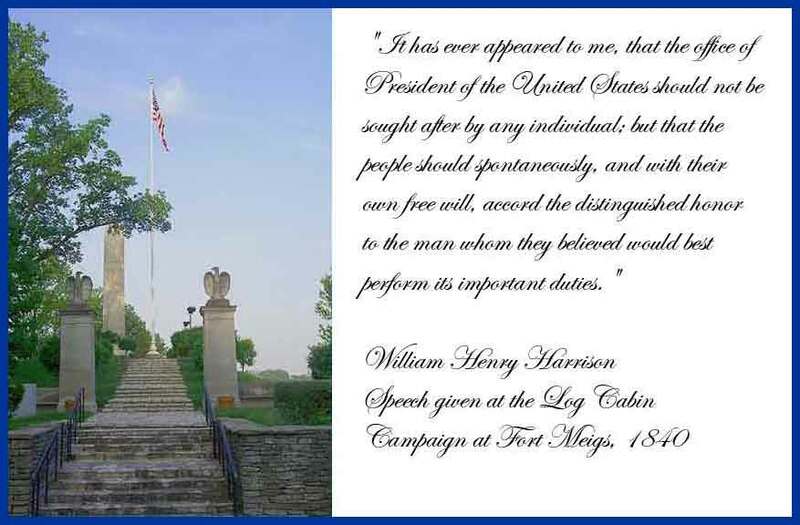 William Henry Harrison is buried on the right, First Lady Anna Symmes Harrison on the left. 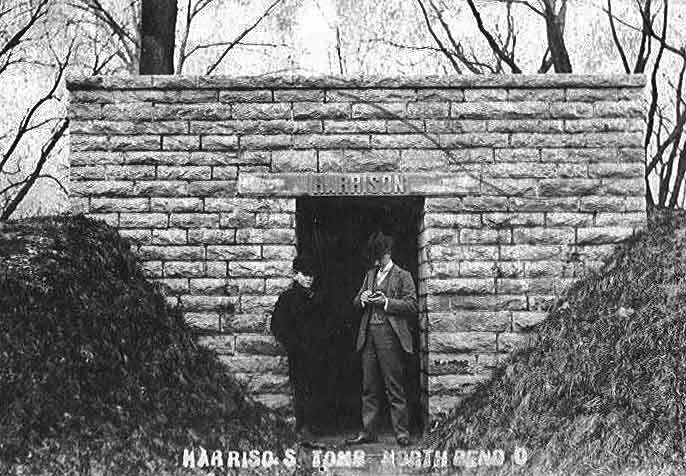 To the far left is buried John Scott Harrison, the only man is U.S. history to be the son of a president and the father of a president (Benjamin Harrison). 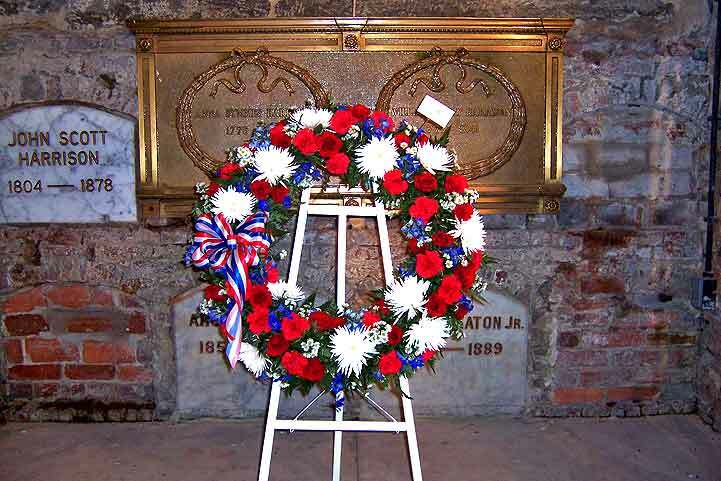 The wreath in the foreground was presented on behalf of President Bush at the February 2005 birthday tribute for Harrison. 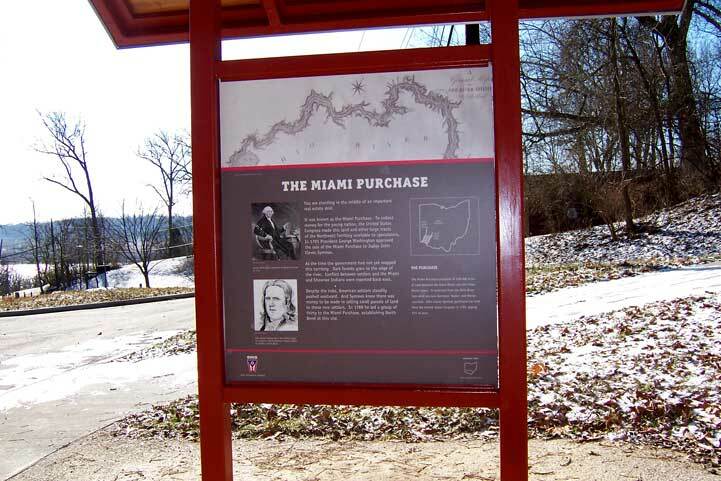 This plaque hangs in the tomb and tells the early history. 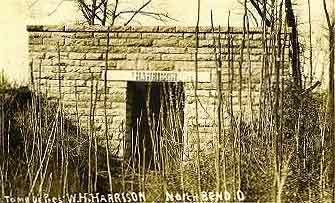 Harrison's tomb was built in 1841 to serve as a permanent place of sepulchre for William Henry Harrison and his wife, and as a temporary place for his family. 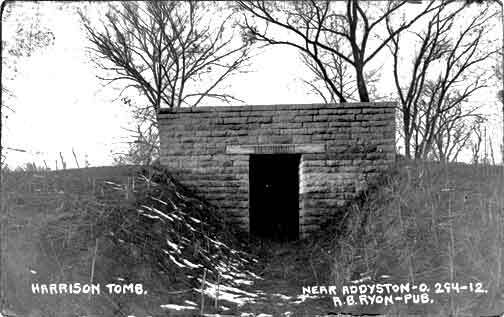 During the course of many years, the tomb and knoll upon which it is located, as well as the small cemetery adjoining, were suffered to fall into decay and ruin, nor was it until seventy-eight years after the construction of the tomb, that legal steps were taken to preserve it and its sacred contents for posterity. 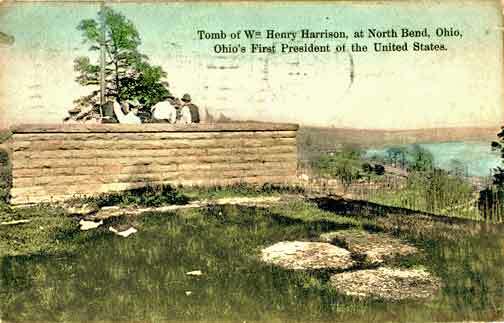 On the first day of April, 1919, Horace Bonser, a member of the General Assembly of Ohio, from Hamilton County, introduced a bill which he had drawn, in the lower house, appropriating ten thousand dollars for the purpose, as the bill recites, "Of placing the tomb and the ground upon which the tomb of William Henry Harrison is located, in a suitable and decent condition in order that the memory of Ohio's first President and gallant soldier, William Henry Harrison, may be fittingly commemorated." 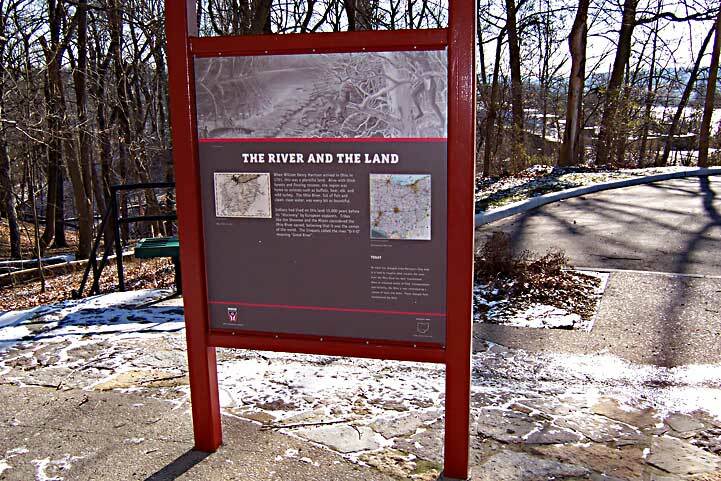 This bill was passed by both houses of the General Assembly and after receiving the signature of Governor Cox, became a law. 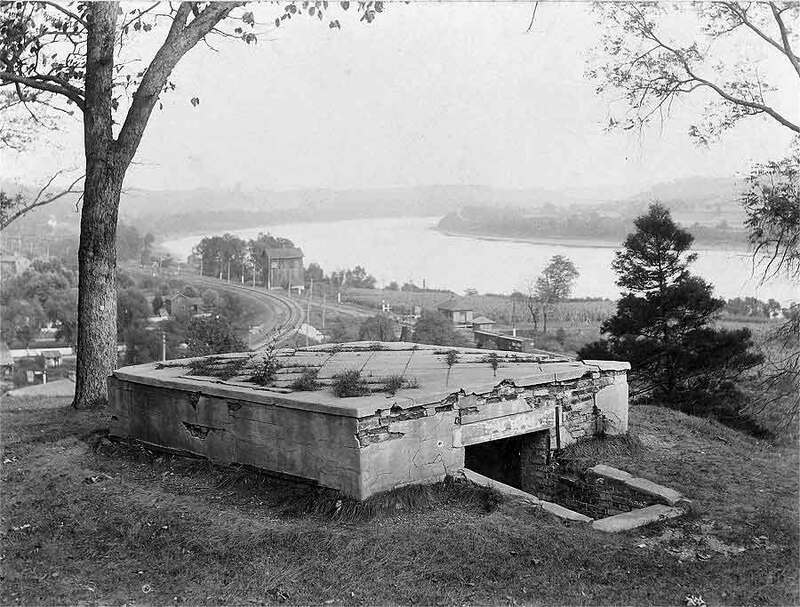 A commission composed of Horace Bonser, William Whipple Symmes and Alfred G. Allen was thereupon appointed by the Governor, which after obtaining title to the property from the surviving Harrison heirs, undertook the work of reclaiming the tomb and tomb site from its then ruinous and neglected state. 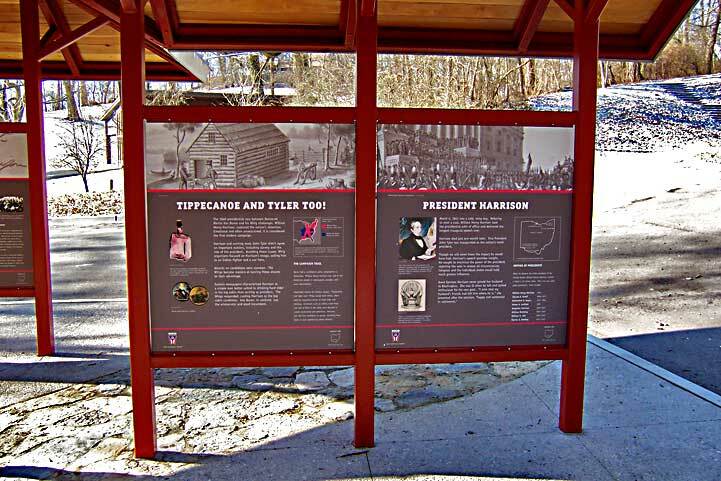 In the year 1921 Governor Davis appointed a new commission consisting of Horace Bonser, William Whipple Symmes and Hallie Stephens Caine, and it was this commission that carried out the work originally planned by the first commission. 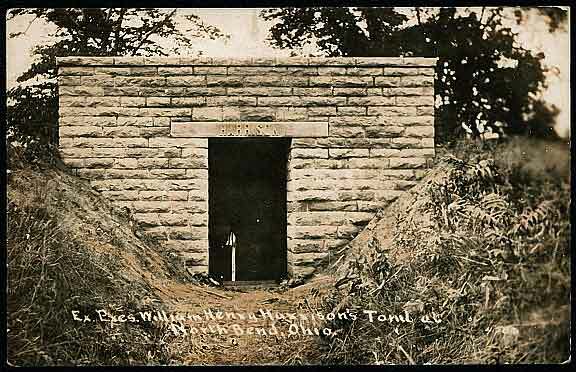 On the 24th day of October 1921 after all preliminary work had been completed, ground breaking exercises were held upon the site of the Memorial Gateway and work upon it finally commenced. 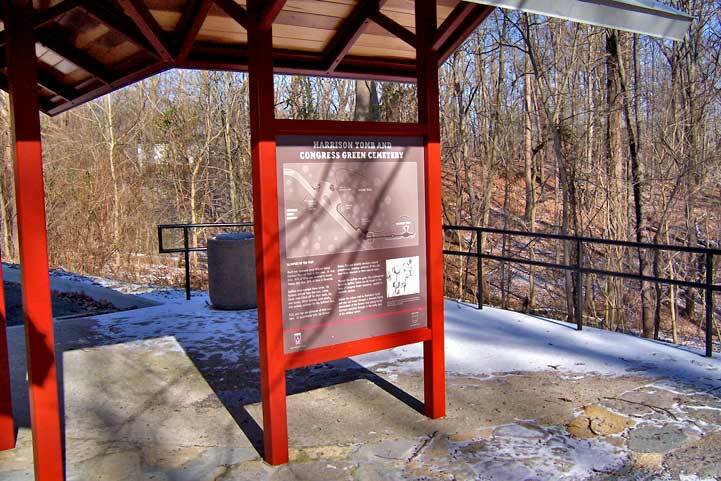 During the Spring of 1922 the Gateway was completed and the property suitably graded and planted with appropriate shrubs and flowers. 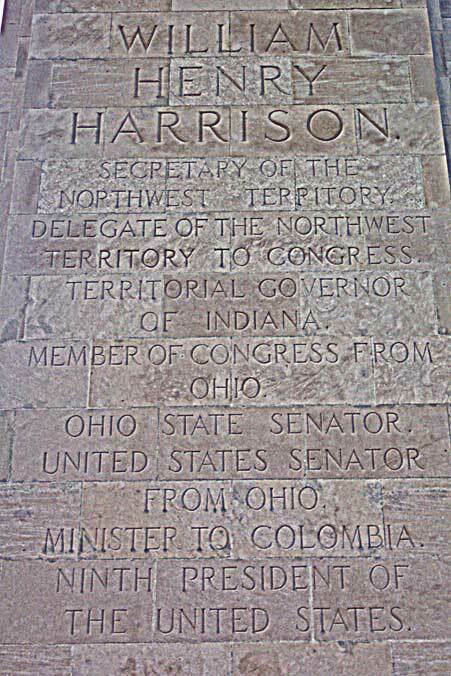 It is in order that posterity may be in possession of all salient facts leading up to the rehabilitation of the last resting place of our country's gallant sons and patriots, that the William Henry Harrison Memorial Commission has caused this tablet to be erected this 14th day of Dec. 1922.